GUELPH, ON – Wellington Brewery has announced a new look for its core line-up of regular brands, and has also bumped up a popular but sporadically available brew to year-round availability. 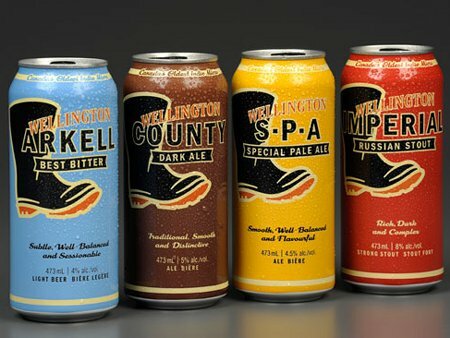 The striking new 473 ml cans for County Dark Ale, Special Pale Ale, Arkell Best Bitter and Russian Imperial Stout feature the Wellington Boot image that has been used in much of the brewery’s marketing material for the past few years. The new cans of County, Special and Pale have already started rolling out to LCBO locations across Ontario, replacing the old packaging. Russian Imperial Stout is the new arrival, and will be available at the LCBO starting on July 6th. Great !! Cans are the way to go for summer !